Pz = sedimentary rocks (248-544 Ma): undivided limestone, dolostone, quartzite, shale, and related sedimentary rocks deposited during the Paleozoic Era. P = Kaibab Limestone (270-280 Ma): an oyster-colored, chert- and fossil-rich, cliff-forming bed of marine sediments consisting mostly of calcium carbonate, deposited on the sloping margin of a shallow sea that extended across what is now northern Arizona for 200 miles during the Permian Period of the Paleozoic Era. Trm = Moenkopi Formation (230-245 Ma): a brick-red, stepped cliff-forming bed of mudstones and sandstones deposited in tidal and nearshore conditions along the eastern edge of an inland sea during the Triassic Period. It contains ripple marks and numerous fossils including those of sharks, amphibians, and reptiles such as Ammorhynchus. 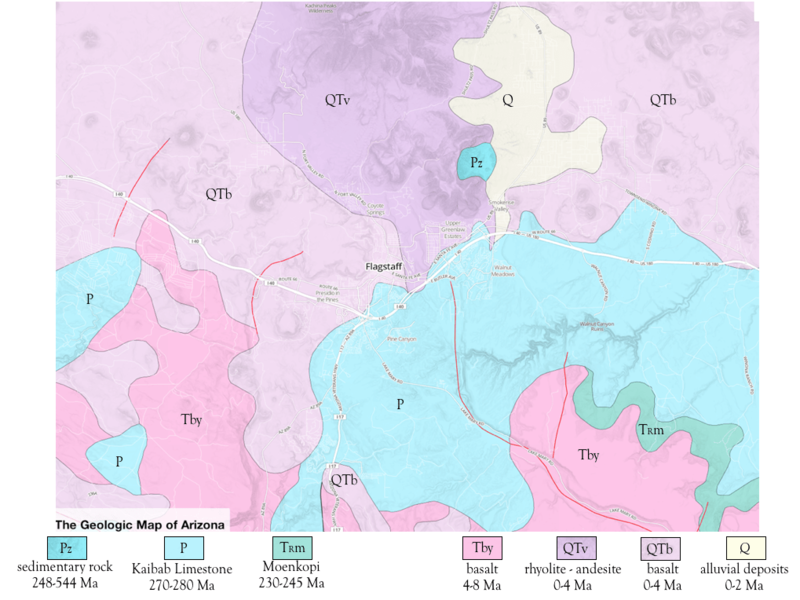 Tby = Basaltic rocks (4-8 Ma): mostly dark, flat, low-lying or mesa-forming, alluvial-covered lava flows with dissected margins erupted from local vents during the Pliocene to Late Miocene in the Cenozoic (current) Era. Qtv = Rhyolite to andesite (0-4 Ma): generally light to medium gray, tan, or reddish brown volcanic rocks deposited as a sequence of lava flows and associated rocks during the Holocene to Middle Pliocene. Qtb = Basaltic rocks (0-4 Ma): mostly dark basaltic lava and cinders with small amounts of andesite, dacite, and rhyolite erupted during the Holocene to Middle Pliocene. Q = surface deposits (0-2 Ma): alluvial (redeposited by gravity) and eolian (wind-blown) deposits including coarse, poorly-sorted alluvial fan and terrace deposits on middle and upper piedmonts and along large drainages; sand, silt, and clay on alluvial plains and playas, and wind-blown sand deposits. Note: Numerous faults lace the Flagstaff area. The larger ones are indicated in red on the map above, while others are evident due to displacement such as may be seen below Cherry Hill and in Switzer Canyon. See NAU’s Arizona Earthquake Information Center for more information about local faults.